BrightStar Casino will then reward you with a bonus (Welcome Bonus is for new players only). The terms and conditions of the bonuses vary between different casinos and might also change over time and between different countries, so it is important to compare the different offers and read the T&C for BrightStar Casino before signing up. 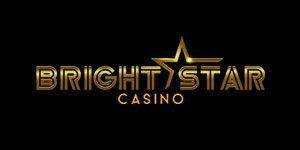 The BrightStar Casino was founded by ProgressPlay Limited in 2017, primarily aimed towards UK players. Players are immediately greeted by a sleek, black and gold user interface, with easy to access categories visible beneath the large welcome banner. Players can choose to keep scrolling, or switch to a specific category of things that interest them, be they slots, roulette, casino games, scratch cards, blackjack or jackpots. The casino has a rather extensive support for players who prefer to gamble on the go – you only need to access the website from your phone or tablet to be taken to the mobile section of the casino, which has fewer titles overall, but still possesses a solid coverage of games. The website can be used with both iOS and Android devices without any issues. Above the welcome banner, players can quickly access support, the VIP section, existing promotions, and they’re given the option to create an account – which is also repeated to the left of the welcome banner, as well as some quick access menus to go to popular games, slots, casino games or jackpots. If you prefer sorting by more precise terms, beneath the welcome banner you can specify which casino games you’re after – blackjack and roulette, as well as access their live versions and scratch cards. While there’s no preview when you mouse-over, clicking the small info button will take you to a written review that tells you what you can expect from that game before you launch it, as well as a rating given to it by the casino’s players. However, not all titles seem to have it – though that mostly seems to apply to new releases, as older titles all had written reviews. The casino has dual licenses and is regulated by both the Malta Gaming Authority and the UK Gambling Commission. The casino offers its players English, German and Swedish, as do most other ProgressPlay casinos. In much the same way, the game uses the latest 128-bit SSL encryption and firewall technology to make sure all sensitive and important data you send the casino is kept secure at all times. Even a quick glance through the library of BrightStar Casino will tell you that there’s a whole lot of games there, by a large number of developers. Microgaming, NetEnt, NextGen Gaming and Yggdrasil are some of the most prominent names that stand out immediately, with a few others scattered about, and the fact you have all four of those in one place is more than worth registering an account. The casino has over 350 different games, in both slots, table games and live casino games. In just about every casino, the most numerous titles are video slots, and it’s no exception in BrightStar Casino, either. Of the 350 different games, it’s safe to say around 300, if not more, fall to slots alone. There’s not much we can criticize in terms of selection, but we wish there was a better ability to sort beyond pressing the slots button and scrolling down to find what you’d like. Despite thoroughly looking, we weren’t able to find an actual search bar on the casino’s main page. There’s also no way to sort by a developer or the sort of video slot you’re after. 5 reel ones play differently than 3 reel games, not to mention the various bonuses you may want to play with or avoid because they’re not your thing. 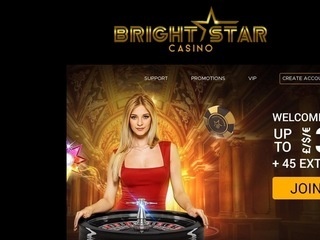 With BrightStar casino being under ProgressPlay’s umbrella, it’s no surprise that it’s offering of table games is the same as in other casinos held by the same parent company. Blackjack and roulette get their own categories, which makes them relatively easy to find and sort through. Other table games like poker and baccarat, meanwhile, require you to sort through other titles to find them, as they don’t have their own categories, and there’s no search bar available to gamblers. If neither table games or video slots are what you’re after, or you’re looking to break up the monotony of things, you can also try your hand at scratch cards, which have their own section. There’s a grand total of seven different titles, as well as a Keno game which is also listed in this category. The live selection in BrightStar casino mostly deals with various types of Roulette and Blackjack, which isn’t surprising, given that these two are the most dominant titles. Players are also treated to two different live baccarat games, and surprisingly enough, no live poker games, which are usually quite popular. Gamblers are able to use credit or debit cards from Visa, MasterCard and Maestro, Paysafe cards, Skrill, bank transfers, Trustly, EcoPayz, Euteller, QIWI, Fast bank transfers and WebMoney for deposits and withdrawals from the casino. For bank transfers, credit or debit cards, Skrill and Trustly, Swedish gamblers get an advantage of a lower pending period for their withdrawals. All of these services take one day for processing, but Skrill beats the competition handily as it only takes one day for a transfer to be completed to Skrill, whereas it takes two, three, or five business days for other methods. Players are faced with a processing fee of $2.5 per withdrawal. The casino offers an extensive FAQ, however, if you require assistance, you can request it through a 24/7 live-chat, or via e-mail.